There is no question that food tastes better when it is beautifully presented. When you are entertaining friends, a decorative table heightens the sense of occasion and anticipation, making a simple meal into a memorable celebration. And even a quick breakfast or an informal brunch is so much more satisfying if it is served up with thought and care. "Table Settings" features 20 themed occasions, ranging from festive meals such as a Thanksgiving dinner of Mother's Day brunch , to a simpler events, such as dinner for two or a lazy weekend breakfast. You don't need family-heirloom china or silverware to recreate these appealing settings--fresh flowers, twinkling tea lights, and quirky decorative touches are enough . For easy reference, there is also a visual directory of international place settings. -Designed for people with busy lifestyles, these stunning ideas by stylist Emily Chalmers are quick and easy to create. -Stylish ideas for decorating the table, whether you are planning a formal dinner party or an impromptu lunch in the garden. 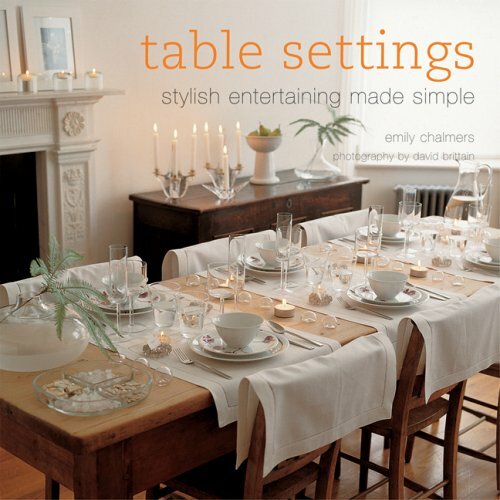 -Make a simple meal into a celebration with "Table Settings". -Mouthwatering photography by David Brittain. Emily Chalmers started her career at "Good Housekeeping" before becoming a freelance stylist and writer, working for magazines such as "Homes and Gardens", "Woman & Home", and "Ideal Home". She is the coauthor of "Style on a Budget" and "Flea Market Style" (both Ryland Peters & Small).